Old Nick’s next production, Hamlet, is now in rehearsals for a June season. Directed by former NIDA director John Clark, this promises to be an exciting new production of the Shakespearean classic. Book now at Centertainment on 6234 5998, or online here. If you would like to enquire about student group offers, click here to … Read moreHamlet is here! The 2009 Uni Revue Omaba Mia! is now on stage, and so is Jake! Jake has confirmed the faith Revue director Craig Wellington showed in him, and last night showed that Revue can take any down-and-out kid and turn him into a star! 2009 University Revue Obama Mia! Now On Stage! Obama Mia! 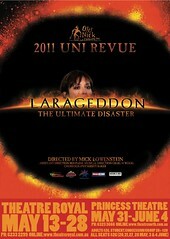 has finished it’s Hobart season, and opens at the Princess Theatre Launceston on Tuesday 26th. May. Obama Mia! opened on Friday night (8 May 2009) and the audience enthusiastically showed their appretiation for the slick, fast and funny show. The new format of one 90-minute act with no interval was also well received. … Read more2009 University Revue Obama Mia! Now On Stage!